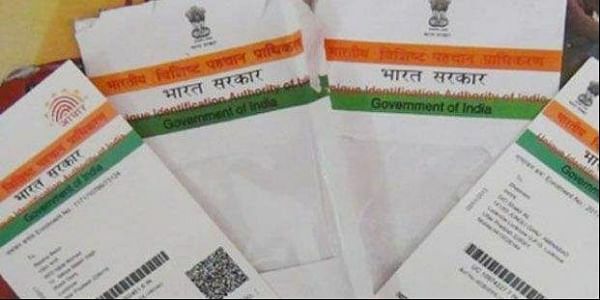 NEW DELHI: The Unique Identification Authority of India (UIDAI) on Thursday said all notifications for presenting the Aadhaar card for various government services stood valid and legal as the Supreme Court had not put a stay on it. The clarification comes in lieu of a video being circulated on the social media and Whatsapp referring to an order passed by the apex court restricting the use of Aadhaar to only a few programmes. Advising people to not get misled by the video, which it said was from August 2015, the UIDAI recommended people to verify their bank accounts, investment accounts, SIM cards, etc. as per the current laws and deadlines at the earliest to avoid any inconvenience. The agency said all notifications issued under section/s of the Aadhaar Act for requiring it as a primary identifier by various ministries and departments of the Government of India and States/UTs Governments for various services, benefits and subsidies stood lawful. Under the Aadhaar (Targetted Delivery of Financial and Other Subsidies, Benefits and Services) Act, 2016, it is mandatory to present Aadhaar card for verification of bank accounts, PAN card, SIM card and various welfare schemes such as Public Distribution System (PDS), LPG, Mahatma Gandhi National Rural Employment Gurantee Act (MNREGA), scholarships, pensions, etc. The Act was passed by the Parliament on March 16, 2016 and was notified in the Gazette of India on March 26, 2016. The UIDAI added the Supreme Court had also approved the verification of all SIM cards with Aadhaar through an order passed in February 2017 in Lokniti Foundation case. It also said that the apex court had upheld the linkage of Aadhaar with PAN in the case of Binoy Viswam vs Union of India which mandates Aadhaar for income tax returns and PAN. Earlier in the day, the Centre informed the Supreme Court it was willing to extend the deadline fixed for compulsory linking of Aadhaar card till March 31, 2018 for availing various services and welfare schemes. The case will now be heard by the Supreme Court next week. The Income Tax Act was amended in March 2017 to make Aadhaar mandatory for PAN cards. In June 2017, the Prevention of Money Laundering (PML) Rules have been amended to make Aadhaar mandatory for linking all bank accounts, insurance, pension, mutual funds, DMAT accounts.